Breathing in sea air helps to fight cancer and to prevent high cholesterol. This is shown by research by Ghent University and the Flanders Marine Institute (VLIZ) as published in the scientific journal Scientific Reports today. Have you ever heard of sea spray? That is the name for seawater that is sprayed in the air by the waves. This sea spray contains a lot of natural substances that are produced by algae and bacteria, and that are good for your health. When you breathe in sea air, you absorb these substances in your body - the known healthy sea air. Researchers at Ghent University have investigated the effects that these substances have from sea air on our genes. "We took samples of the sea air and examined them in the lab," explains UGent researcher Emmanuel Van Acker (Faculty of Bioscience Engineering). "We have exposed human lung cancer cells to those air samples, and examined which health effects they cause. We specifically looked at the effects on our genes, and compared this with results from other scientific studies." The research has shown that sea air inhibits the effect of a gene that plays an important role in lung cancer and in cholesterol levels. His colleague Jana Asselman explains: "Previous studies have shown that lung cancer cells are dying and cholesterol is falling when we slow down this gene. New potential cancer therapies and the latest generation of cholesterol inhibitors work on this same gene. Now that we know that sea air also slows down the effect of this gene, we can expect sea air to have a similar positive effect on health." Emmanuel Van Acker won a Brilliant Marine Research Idea (BMRI) grant in 2017, funded by memberships and donations to the VLIZ philanthropy actions. VLIZ researcher Maarten De Rijcke once started this research fro marine aerosols when he a PhD student at Ghent University himself: "The research was initially limited to observing the effects at the cellular level: do the cell lines remain alive or do they die after exposure to sea spray? With the BMRI grant an extra genetic twist could be given to the research. The expensive sequencing costs could largely be paid for, so that the much more detailed gene expression could be looked at." The research is currently still in full swing. The researchers are now trying to find out which specific substances in the sea air cause these effects and to understand what these substances do with other cells in our body. 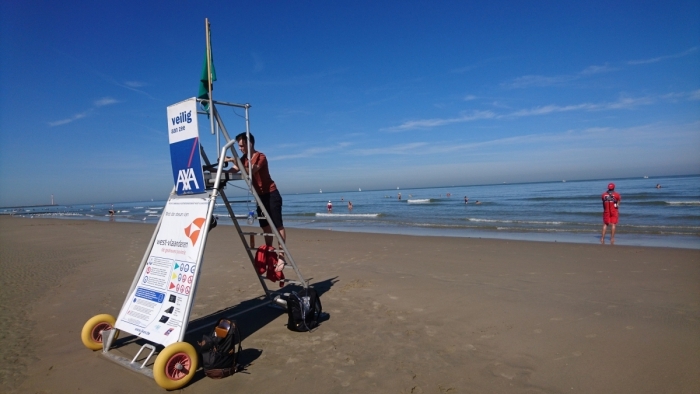 "VLIZ supports the monitoring logistically by taking monthly aerosol samples at the sea side for the UGent researchers, something that is expanded in the summer with weekly samples on the beaches of Ostend and Bredene, in order to be able to better estimate the positive impacts of sea spray on the bathing guests coming to the Flemish coast", explains Maarten de Rijcke. VLIZ director Jan Mees adds: "In the future, VLIZ will continue to focus on this very interesting research line of Oceans & Human Health within the VLIZ research strategy. The subject also ties in very nicely with the Blue Tourism innovation domain of the Blue Cluster, recognized by the Flemish government as an innovative spearhead cluster." The research is published in the scientific journal Scientific Reports and is freely accessible to everyone.